The New Year provides an opportunity for a fresh start for many people personally and professionally. But it is also a time for reflection on the success and the blessings that the previous year has gifted. In a new report , Bielat Santore & Company looks back on some of their noteworthy work in 2017, while looking forward to a bigger and better 2018. 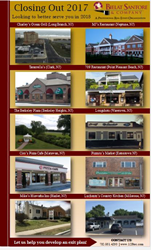 Major sales include: Charley’s Oceanfront Grill, Long Branch, NJ; MJ’s Restaurant, Neptune, NJ; Tarantella’s, Clark, NJ; 709 Restaurant, Point Pleasant Beach, NJ; The Berkeley Plaza, Berkeley Heights, NJ; Longshots, Waretown, NJ; Ciro’s Pizza Cafe, Matawan, NJ; Pizzuto’s Market, Eatontown, NJ; Mike’s Hiawatha Inn, Hazlet, NJ; Luchento’s Country Kitchen, Millstone, NJ. To read further, visit https://bielatsantoreandcompany.wordpress.com/. For a complete list of Bielat Santore & Company’s sold properties, go to the firm’s website at http://www.123bsc.com.